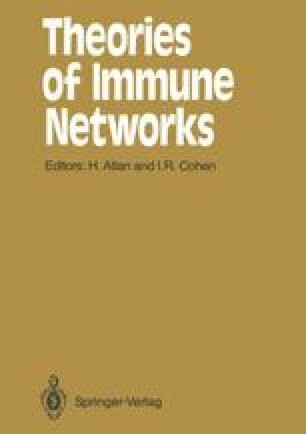 Elsewhere  we put forward a network model of the immune system that explicitly incorporates cross-reactivity between clones. Receptor shape and hence reactivity was described by a single real number, x, whose value might be viewed as representing the depth of the antibody combining site or the height of a complementary idiotypic “bump”. Each clone was thus described by a unique value of a shape parameter x, and a rule was specified for determining the degree of reactivity of clone x with other clones y. A population dynamic model of interacting clones in a one-dimensional “shape space” was then developed that led to certain strategic insights concerning the operation of the immune system.